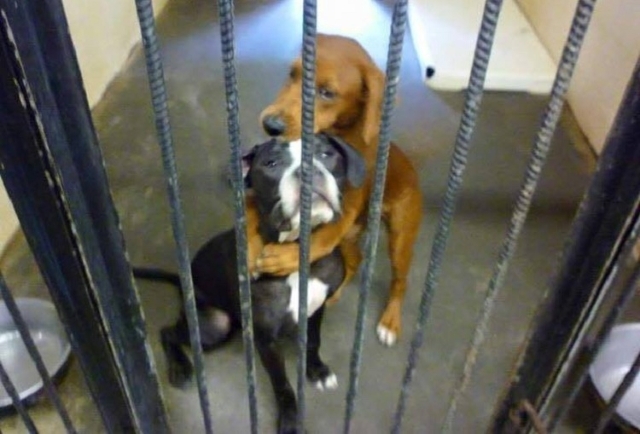 Two dogs in a shelter, just hours away from being put to sleep, hugged their way to safety. The dogs -- Kala and Keira -- were photographed hugging each other in a cage at an unnamed shelter. In the photo, Kala's brown front legs and paws are in a tight embrace around Keira's neck. Both dogs appear pensive and fearful, as if they know what's coming. The photo immediately went viral, garnering thousands of shares and likes. It also yielded results. Just two hours after the photo was posted to Facebook, Angels Among Us said the dogs had been rescued and had left the shelter, on their way to see a vet and then on to a foster home. The dogs — Kala and Keira — were photographed hugging each other in a cage at an unnamed shelter. In the photo, Kala’s brown front legs and paws are in a tight embrace around Keira’s neck. Both dogs appear pensive and fearful, as if they know what’s coming. On Monday Angels Among Us Pet Rescue — an Atlanta-area nonprofit that works to save dogs and cats from being euthanized in shelters — put the picture on its Facebook page. Angels Among Us also shared the dogs’ desperate plight: Shelter employees said Kala and Keira would be put down that day unless someone adopted them or offered to foster them. Angels Among Us pleaded with anyone who saw the post to step up and help. “If you’ve ever wanted to foster but just couldn’t quite decide, now is the time to say YES! !” Angels Among Us says in its post. The photo immediately went viral, garnering thousands of shares and likes. It also yielded results. Just two hours after the photo was posted to Facebook, Angels Among Us said the dogs had been rescued and had left the shelter, on their way to see a vet and then on to a foster home. A second, happier photo of Kala and Keira is now making its rounds on social media.